It is not a surprise if it is the first time you hear about teff. 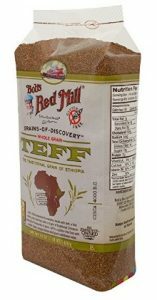 Teff is a small cereal grain that has been grown as a food crop in East Africa for thousands of years. The name of teff in Ethiopia (tef) which means ‘lost’ due to the small size of the grain and its easiness to be lost if dropped. It is probably the smallest starch-containing kernels. Teff is commonly grown from near sea level to altitudes of over 3000 meters because of its ability to grow in various conditions including rainfall levels, temperatures and soil regimes. Now, teff is still the major staple crop in Ethiopia and Eritrea, where it is enjoyed in the form of a fermented spongy flatbread (injera), porridge (muk), alcoholic drinks (tela), and unleavened dry bread (kita). 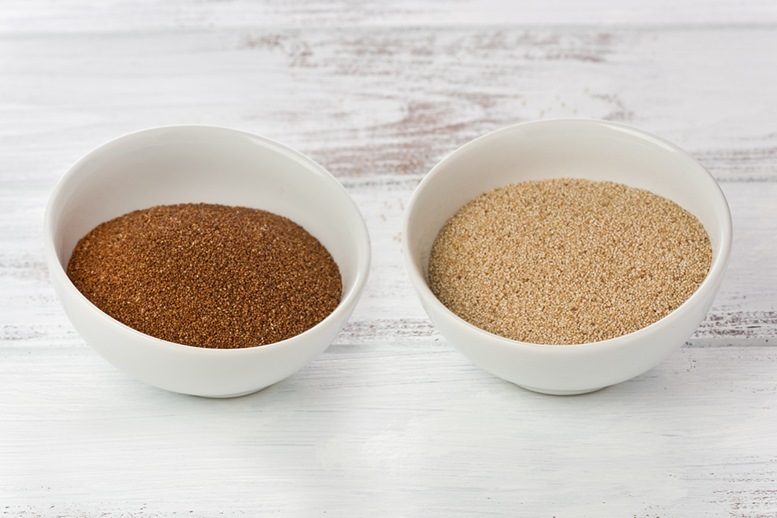 There is a growing interest in teff due to its gluten-free status and appealing nutritional profile which make it a suitable wheat substitute for people with coeliac disease. When consumed as whole grain, teff has higher nutritive quality than the other major cereal grains such as wheat, maize and barley. 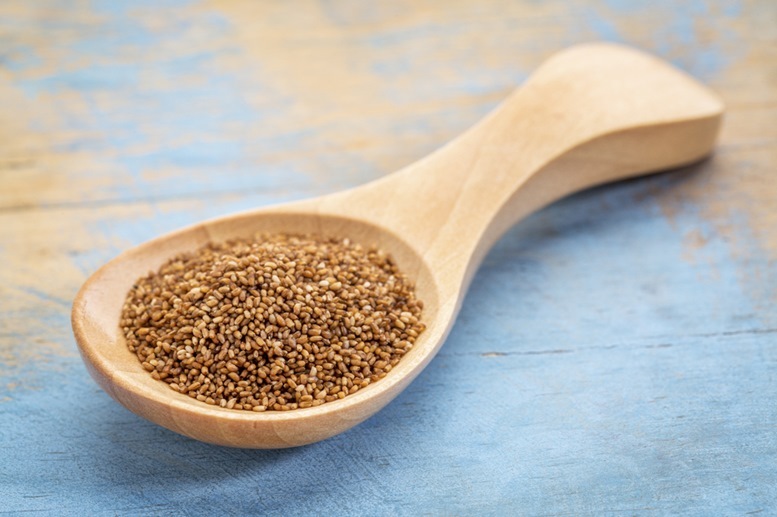 Teff serves as an excellent source of essential amino acids, just like quinoa, because of its high content of the lysine that is most often missing in other grain foods. For Ethiopians, two-third of their dietary protein intake is from teff. Teff is also an exceptional source of fibre and minerals. Plant, seed and flour of Teff. Injera, muk, tela and kita made from Teff. Teff contains 8.7-11% protein, which is comparable to the common cereals such as barley, wheat, maize, and millet. The major types of protein in teff kernels are glutelins and albumins, which are the most digestible types. Hence the bioavailability of teff protein is considerably high. Teff combines an excellent content and balanced essential amino acids due to its high content of lysine. 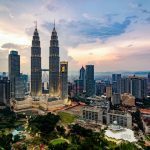 Moreover, it contains lower prolamin fraction than most other cereals, except the rice and oats, making it a good choice for people with celiac disease. Teff contains more calcium, iron, manganese and zinc than most cereals. 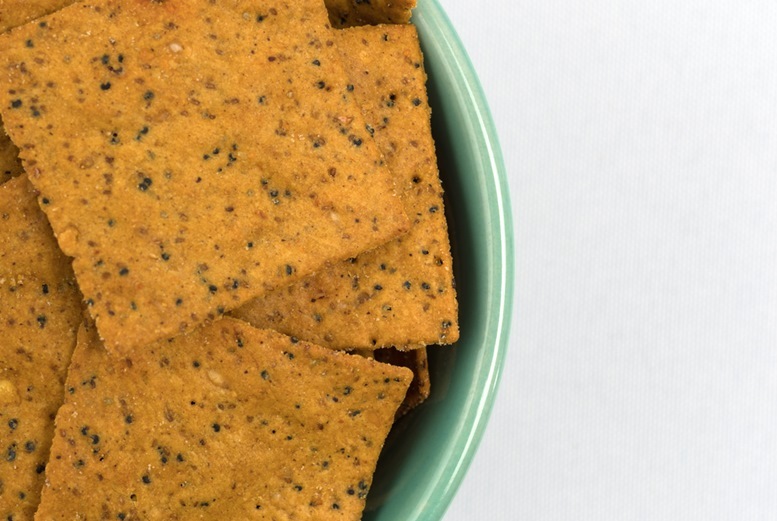 One serving of dry teff provides us 25% magnesium, 20% iron and 10% calcium of our daily recommended intake. Teff also contains good levels of vitamins A and C, as well as vitamin B3, B2, and B1. One hundred grams of teff offers 50%, 33%, 33% and 50% daily requirement of thiamine, riboflavin, niacin and vitamin B6. 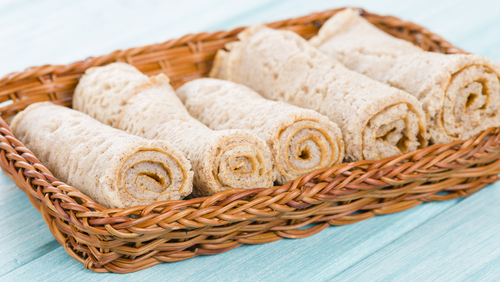 The amount of vitamins is even increased during the yeast fermentation involved in the production of injera. The amount of fiber in teff is particularly high (3% dry basis) and exceeds that of most other cereals (2% dry basis), rye (1.5% dry basis), rice (0.6% dry basis) and sorghum (0.6% dry basis). The high fibre content of teff is due to the fact that teff is always consumed in the form of whole grain which contains both bran and germ. The elimination of the milling process allows all the fibres present in the bran are retained. Teff is packed with calcium. There are 180 mg of calcium in every 100 g of teff. The amount of calcium in one cup of cooked teff is comparable to a glass of milk or half a cup of cooked spinach. Hence, teff is a great calcium alternative to those restrained from dairy. The high calcium content of teff help to strength our bones and prevent osteoporosis. 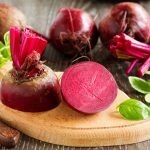 People having iron and vitamin B deficiency are prone to anemia. Teff is high in iron. 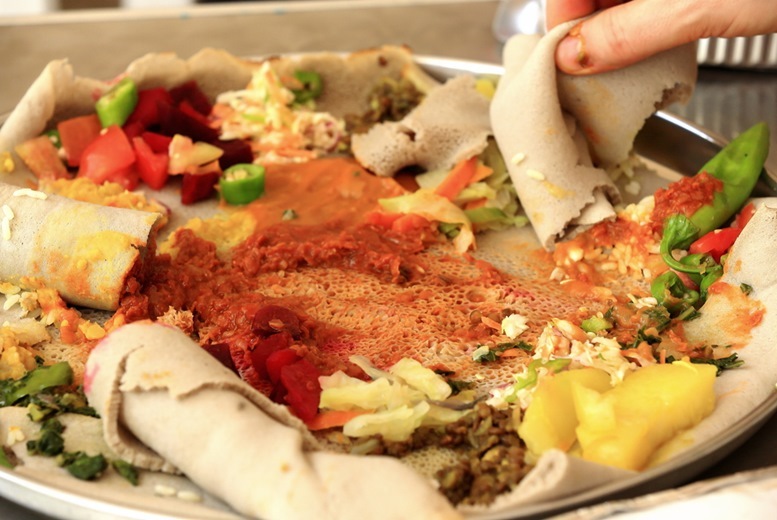 The fermentation process used in preparing injera also destructs phytic acid and increase the bioavailability of iron. This explains the low frequency of anemia in the highlands of Ethiopia, where teff is the first cereal crop. For people with iron deficiency, eating fermented teff products is a good way to boost your iron absorption and prevent the onset of anemia. Two cups of teff provide you with your daily requirement of dietary fibres. The high dietary fibre content of teff stimulate the bowel movement and prevent constipation. Teff is a good choice for people on a diet because it is low in calories and sodium content and high in dietary fibre. Replacing part of your staple with teff grain helps you to kick off your weight loss regime. 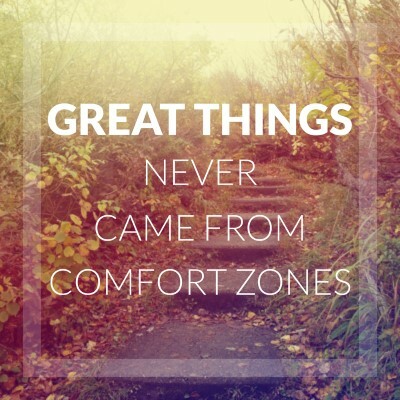 It boosts your satiety and keeps you full for a longer time. It is mainly because the dietary fibre of teff increases the viscosity of digesta which slows down the stomach emptying rate and impedes the enzymatic breakdown of the food starch. Teff is considered as one of the best grains for diabetic patients to control their postprandial blood glucose level. The resistant starch of teff resist digestion and contributes to the overall slow digestion rate of teff. 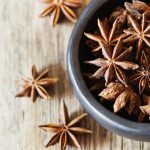 It helps diabetics prevent the spike in blood glucose level within the short time after meals. Moreover, teff is consumed in the form of whole grain, a complete package of minerals, vitamins and phytochemicals. 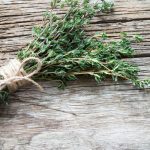 For this reason, the synergistic effect of all the especial macro- and micro-nutrients help prevent or control diabetes. Teff is a good source of minerals, vitamin C and vitamin B. Vitamin B6 is a vital vitamin that supports the function of our immune system. Vitamin C works as an antioxidant that stimulates the production and activity of white blood cells. Moreover, teff contains zinc, a mineral that regulates and maintain the function of immune system. 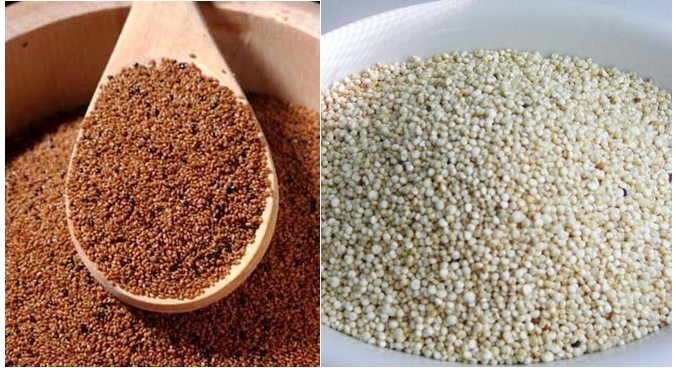 Dietary fibre of teff reduced the amount of low-density lipoprotein (LDL) cholesterol level in our blood stream. Oxidation of LDL cholesterol is the main cause of atherosclerosis, the direct cause of coronary diseases. Eating teff lowers blood pressure which is another factor that increases the risk of stroke and heart attack. Hormone imbalance is one of the major that lead to PMS symptoms. The high phosphorus content of teff (30% daily value) facilitates hormone balance. Copper content of teff boost the energy production and relieve women from fatigue. Moreover, the high calcium content of teff helps to alleviate the PMS symptoms and keep the bones strong. Teff is consumed as the staple food in Ethiopia for thousands of years. It is perfectly safe to be consumed at a moderate level. Excessive consumption of teff might pose adverse effects. Teff is high in fibre and excessive consumption fibre might cause the problem of bloating and gas. The level of thiamin in teff is typically lower than other cereal grains such as wheat, rye, barley, oats, maize and sorghum. 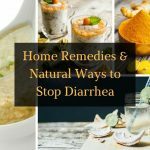 When it is taken as the major staple food, thiamin supplement is recommended. Teff is also known as the lovegrass seed because the plant teff itself is also called Williams lovegrass. Different from other cereal grains, the bran and germ cannot be removed from teff because of its tiny size. So teff is always consumed in the form of wholegrain. 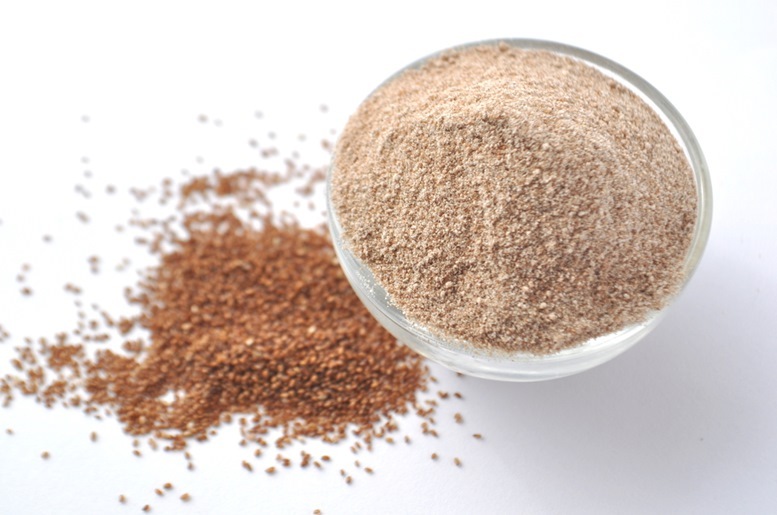 Teff seeds come in various colors, such as white, yellow, purpose, red and brown. One gram of teff contains 3000 grains. Teff requires the shortest time to sprout among all the grain (~ 36 hours). Teff is an annual grass that grows fast. The grains are ready to be harvested 10-12 weeks after plantation. The taste of teff grains is mild, nutty, earthy. Teff is the major source of protein and energy in Ethiopia. It is even true for the long-distance runners from Ethiopia who wins the Olympic medals. Teff is used to fermented gluten-free beer. The straws of teff plant are mixed with mud to be used a building material. The per cent daily values are based on 2000 calorie diet. 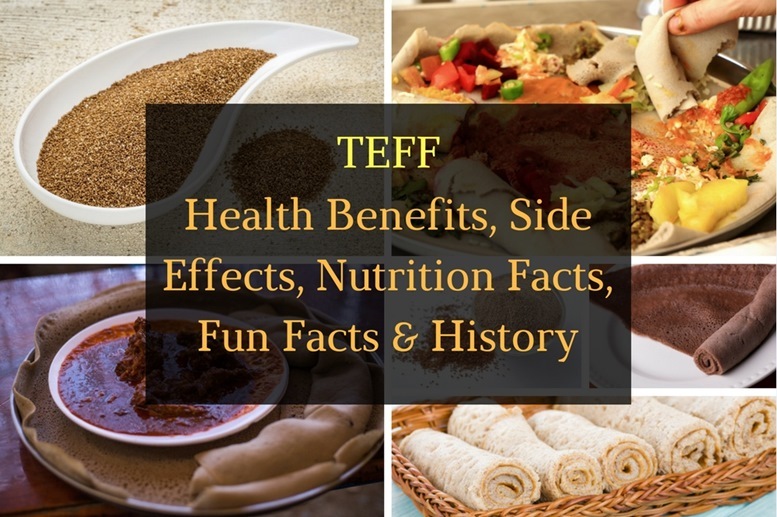 Teff is the most ancient indigenous staple food in Ethiopia but little information is available on the early history of teff. 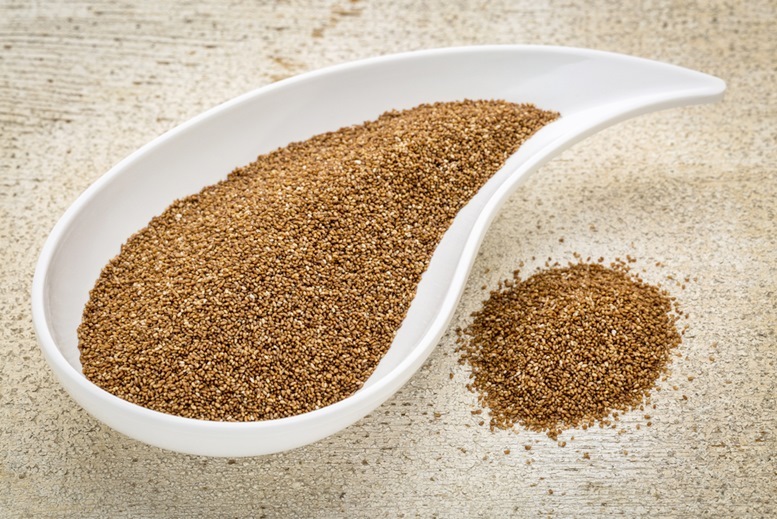 It is believed that the domestication of teff happened 4000 BC in Ethiopia before the introduction of emmer and barley. There are teff seeds found in the Pyramid of Dashur and the ancient Jewish town of Ramses which were built in 3359 B.C. 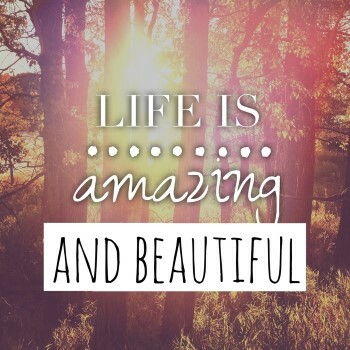 and 1400 B.C., respectively. Teff belongs to the Eragrostis genus which contains more than 300 species. Teff adapts to the dry-landing farming in Ethiopia where it thrives in both droughts stressed and water logged soil conditions. 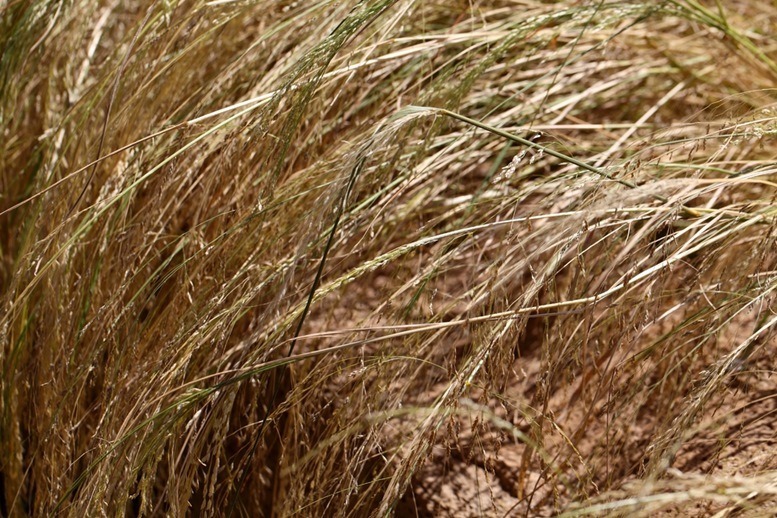 Most teff cultivars require at least three good rains during their early growth. Cultivation of teff is labor intensive that 18-40 person is required to working on one hectare. There is no published data on the worldwide production of teff. Ethiopia is the only country in the world that use teff as a cereal crop.Teff is the second most important cereal crop (17.12%) in Ethiopia just after maize (24.5%). The area of teff cultivation in Ethiopia is about 2.76 million hectares. However, the lower yield of teff makes food security a national problem for Ethiopia. Now, teff is attracted more interest outside its native East Africa because of its gluten-free nature. It was introduced to the United States in the 1980s and is cultivated only as a healthy grain. During the last decade, the price of teff increased by 30-36%. 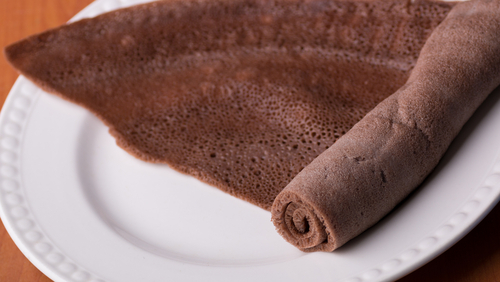 The most popular usage of teff is to make injera, a fermented flatbread. 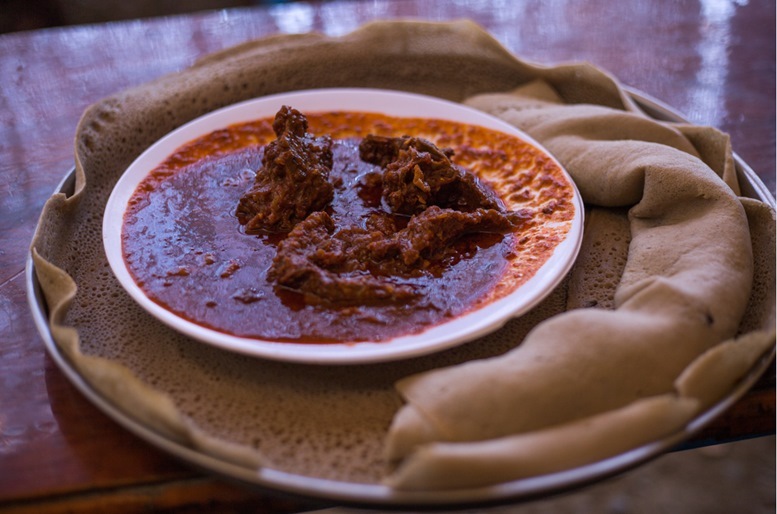 To prepare injera, teff flour is mixed with water in a 1:1 ratio and kneaded to form a dough. The dough is covered and allowed to ferment for two to three days. Lactic acid bacteria are mainly responsible for the spontaneous fermentation process. The batter is then poured onto a hot-round flat griddle and covered with a metal lid. The injera is done after 2-3 min baking on the griddle. Typical ethiopian injera food made of teff cereal -eragrostis tef- with vegetables-tomato-potatoes-some meat.